For added safety, The Handy Chainsaw Starter Kit offers protection and peace of mind whilst operating a chainsaw. 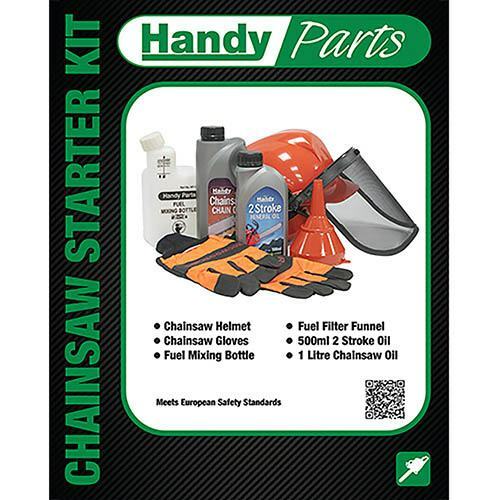 Consisting of a heavy duty chainsaw helmet, gloves, fuel mixing bottle, filter funnel, 500ml 2-stroke oil as well as 1L chain oil, this all-in-one kit provides you with everything you need to get going with your chainsaw, whilst keeping yourself safe. The chainsaw helmet has ear defenders and visor which importantly will protect your head, face and ears whilst operating machinery and the chainsaw gloves provide extra comfort and protection. The fuel mixing bottle and filter funnel allows for simple and accurate mixing of 1 litre of fuel with 2-stroke oil and can be easily transported around to your work place. There is also a bottle of 2-stroke oil and chain oil included so you can get to work immediately!